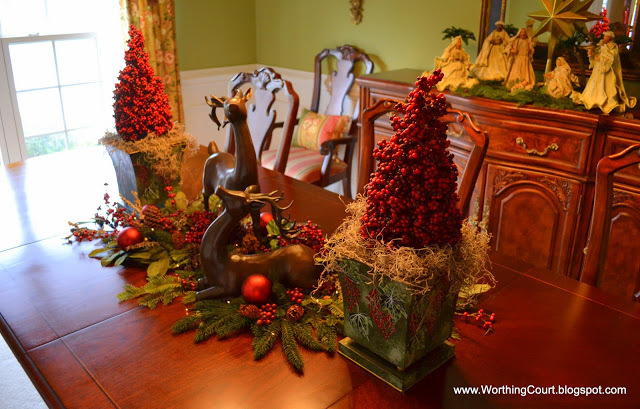 I’m going to show you my Christmas decorations starting in the dining room so that I can participate in Layla’s Christmas Tables party over at The Lettered Cottage. 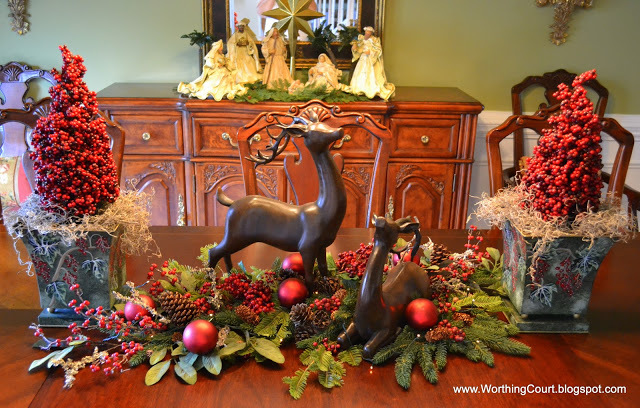 I used the same deer that were in the centerpiece on my Thanksgiving table as part of this Christmas centerpiece. I’ve had the containers that the berry topiary trees are in for years. I love them as much today as the day that I bought them. 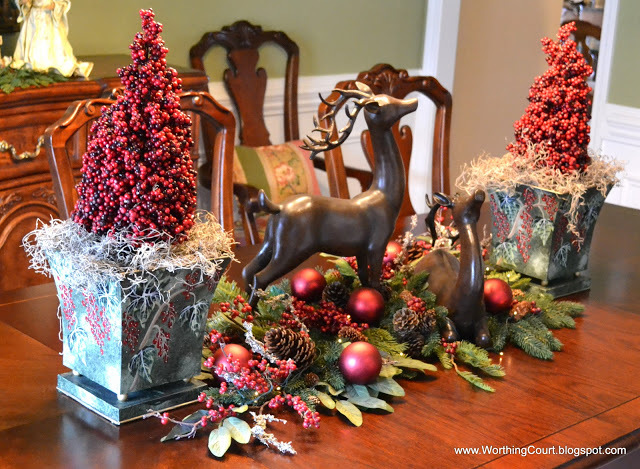 I started the centerpiece by placing the deer in the center, then layering a mixture of different pieces of faux greenery and berries that I had in my Christmas stash. I added two strands of tiny battery operated lights, but you can barely see them in these pictures. 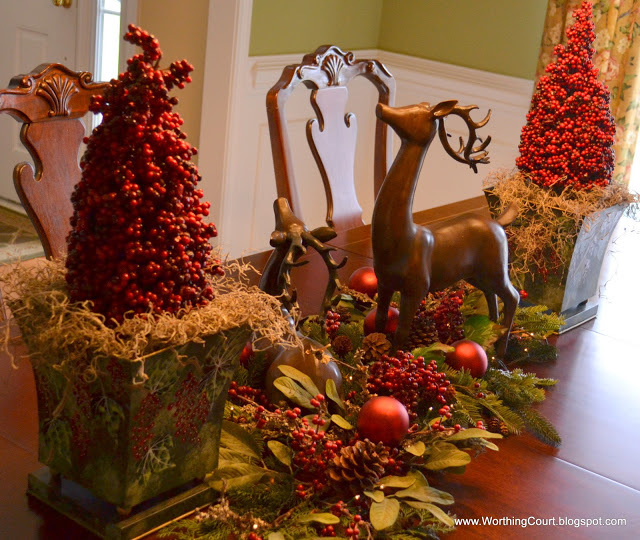 The urns were placed at each end and a few cranberry red Christmas ornaments were added. Here’s how it looks from the back. I like to use Spanish moss to fill in the empty spots in the containers. I think it helps keep the whole thing from looking too formal. I placed my nativity scene over on the sideboard. I purchased this nativity at Caryl’s Christmas Shop. The star is actually a tree topper, but I like the way that it works with the nativity scene. I display this in a different spot every year and have never been quite satisfied with how it looked until I tried it out on the sideboard. I think this is the perfect spot for it. I added a few faux palm trees and filled in around the figurines with faux cedar. The mirror above it was looking a little empty so I added a wreath made with beaded fruit. Thank you for stopping by for a visit today. It’s been a pleasure to have you! I’ll be linking to these parties in addition to Layla’s party that I mentioned above. Suzy, this is beautiful! 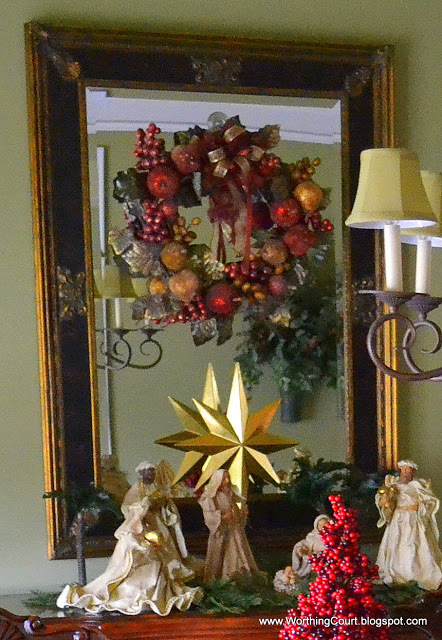 The star behind the nativity scene is perfect for addinng height and balance, and I love the wreath on the mirror. I too am particial to deer in my holiday decorations…ylove yours. Of course your Verbena painted walls is the perfect backdrop for a beautiful holiday room. I love your wreath on the mirror too, as well as the nativty. Sooo pretty! Your Nativity is just gorgeous!!! One of the prettiest I’ve ever seen! I love it with the star and the reflection from the mirror. Mirrors just make a room sparkle. Also wanted to say thank you for stopping by 21 Rosemary Lane and leaving such a nice comment. This is so pretty. 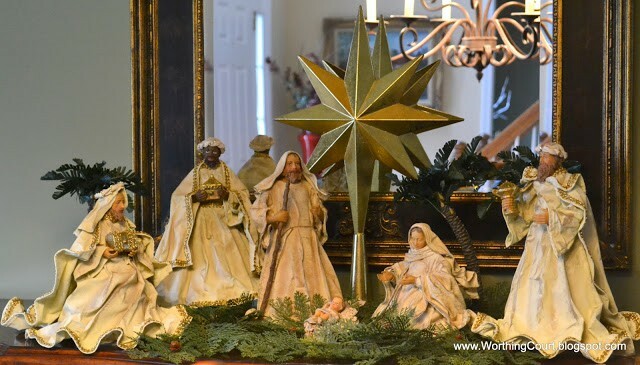 Love the centerpiece and the nativity. Very pretty, I especially love the reindeer. Beautiful!!! I know the family will feel right at home for the holidays! What a beautiful centerpiece! I love it and your pots with the little holly trees. Your sideboard set up with the Nativity is so pretty! That’s a lovely Nativity too! The wreath on your mirror is so pretty! 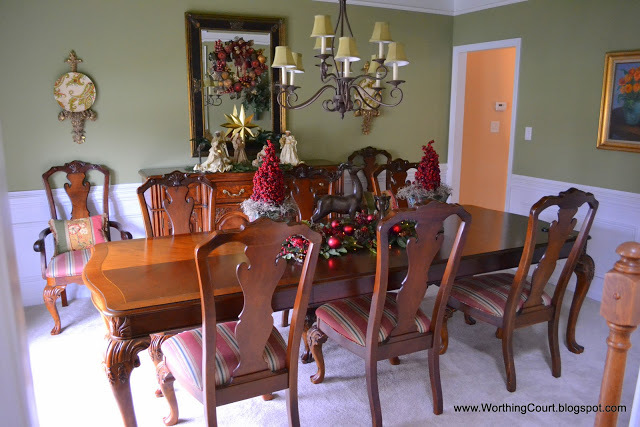 You have done such a great job of adding Christmas to your beautiful dining room. The nativity is stunning and I love the little palm trees! 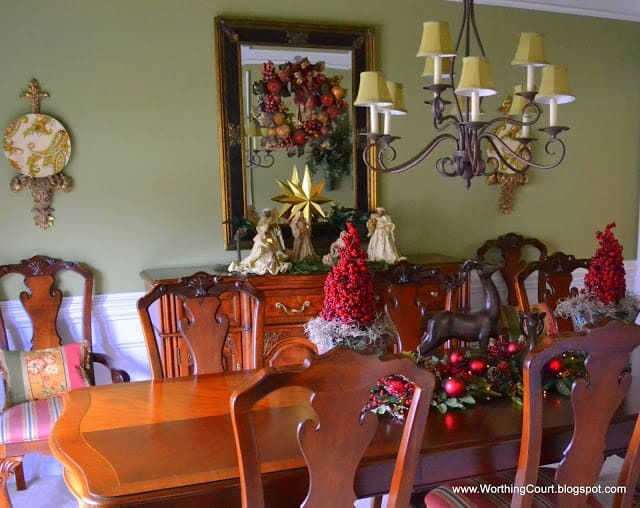 Your dining room is gorgeous…I love everything..the reindeer and berry vignette on the table to the Nativity on the buffet. Simply gorgeous! Merry Christmas! Beautiful! Love the berry trees! The wreath on the mirror is also very lovely! Great job on everything!